Imagine siting down to a breakfast chickpea flakes? This situation may be a reality if a new Australian research project comes to fruition. 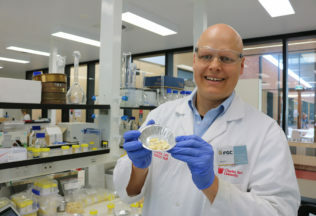 Working with Uncle Toby’s and Woods Foods, a pulse processor in Queensland, a PhD candidate, Stephen Cork, will be exploring how best pulses like chickpeas could be turned into breakfast flakes or health foods. “Pulses like chickpeas are high in protein, low in fat and are a great source of minerals and B vitamins but many Australians don’t meet the recommended dietary intake of one to three serves of pulses per week,” Cork said. “The low consumption has been attributed to the time and effort required to prepare them, which typically involves soaking and boiling for over one hour, and the need to modify sensory attributes such as texture and flavour. According to Cork, the different chemical compositions of cereals and pules means there is need for research into how to apply processing methods like flaking to pulses. “My research is examining how pre-treatment, flake formation and secondary processing impacts the behaviour and quality of the product,” Cork said.